Structural/Civil Engineering App for elastic analysis of general 2D concatenated beams. 2D structural concatenated beam models can be created and analysed. There is an emphasis on quick and precise input of high-resolution data through graphical tap-and-drag interaction, with numeric input available as an alternative. Automatic concurrent analysis ensures that up-to-date results are conveniently available after every edit. Clear graphical representations of deflections and force envelopes are interactive with slider bars for reading off results at any point along the members. A concatenated beam is one in which each end of each beam connects to no more than one other. By way of example this includes multi-span beams and simple portal frames, but not frames with ties or bracing nor multi-bay or multi-storey frames. • Added report geometry cover sheet. • Added worst-case highlights (blue) on results. • Added Airprint support for reports and integrated help. • Changed e-mail export encoding for better compatibility with some e-mail servers. • Added Canadian section library. • Added “Tension”/“Compression” notice on member results. • Enhanced report loadcase cover sheet. • Expanded American C sections. • Added American MC, L, and S sections. • Added asymmetric bi-plate and tri-plate custom section generator. • Fixed a bug in the solid rectangular section generator. • Added density to user materials. • Miscellaneous updates & fixes. • Added South African sections. • Added more Replay demonstrations. 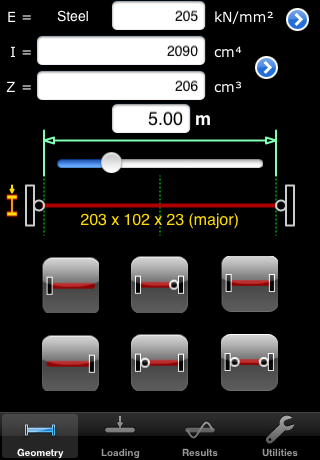 • Added trigonometrical functions to calculator. • Added additional materials to the standard library. • Changed standard concrete modulus of rigidity to 5.9kN/mm2. • Materials can be assigned to members independently of choosing cross-sections. • Section-library user interface enhanced. • Improved selection of loads when coinciding at same screen position. • Adjusting one load will cause all similar selected loads to adjust accordingly. • Member pins now applied or removed, not toggled. • Added import/export via e-mail attachment (iOS 4.0+). • Chosen unit system is preserved over a session save/restore. • Added axis labels in results view. • Upgraded to a Universal App for use on iPads. • E-mail import/export of models. • PDF export of analysis results via e-mail. • Points of interest for results on selected members. • Added extra Australian SHS & RHS sections to section library. • Added Japanese HJ sections to section library. • Fixed bug relating to the setting of section properties. Additional features & bug fix.